Researchers from Woods Hole Oceanographic Institute and Texas A&M were recently monitoring natural hydrocarbon seeps in the water column as part of their research, when they came across something incredible that they were not expecting. 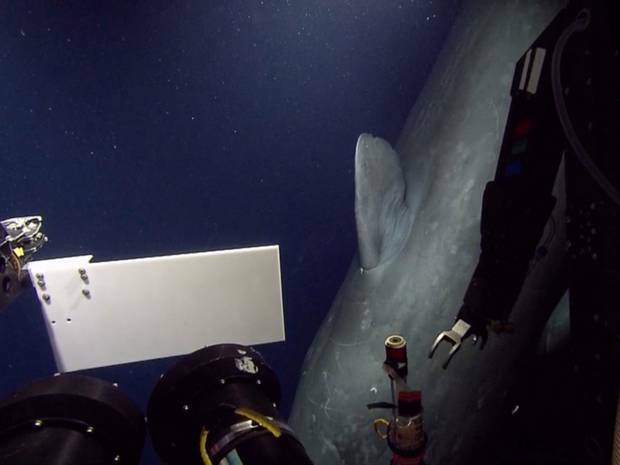 Whilst filming with their remote operating vehicle (ROV), the team were surprised to suddenly come across a sperm whale at a depth of 600 metres. Apparently curious as to what exactly the ROV was, the sperm whale spent several minutes inquisitively investigating the strange object. The whole event was captured by the ROV’s on board camera and makes for a fascinating watch. Sperm whales have long been known as deep sea divers, but actually seeing one at this depth adds new perspective into their lives and contrasts to how we normally perceive them at the oceans surface. For more information on what the researchers are trying to accomplish from their work, visit Nautilus Live, where they are streaming their exploration 24/7 for the next six months. The video of the incredible encounter can be seen below.